Take a moment to glance down at your laptop. 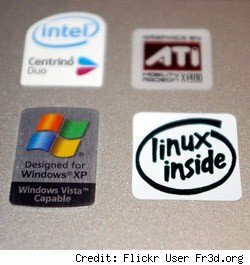 Chances are, you see a bunch of hideous, glittery stickers, with the names or logos of companies like Skype, Intel or Microsoft [Ed. Note: Nope! Just see white. Cult of Mac!]. Don't try and remove them, though. Scratching off these stickers, as with Chicken Pox, will only result in even uglier scars and residue. So, why are they there? The New York Times' David Pogue recently looked into the laptop flair phenomenon, and discovered that there's a very unsurprising explanation for all the annoying stickers most laptops sport: money.